About the Author: Sue Patton Thoele is a psychotherapist, former hospice chaplain, and bereavement group leader. She is author of eleven other books, including The Courage To Be Yourself, The Woman's Book of Soul, Growing Hope, Freedoms After 50, and The Woman's Book of Courage. Sue and her husband, Gene, live in Colorado near their adult children and grandchildren. For more information, please visit www.suepattonthoele.com. Because women possess an innate ability to perceive an expanded range of feelings, thoughts, and experiences, we are adept at consciously handling several things at once. That doesn't mean you don't get frazzled and frustrated. It does mean you can feel even better and more productive by attentively, purposely, and nonjudgmentally staying in the present moment. Having qualities such as diffuse awareness and sensitivity means you already possess excellent tools for creating a more peaceful, loving, and mindful life. With awareness and intention, you can be mindful within your busyness - the caveat being that busyness needs to be comfortable and enjoyable, not a fear-based busyness. Your thoughts and intentions announce your deepest wishes, desires, and goals to your subconscious mind, or inner sage, whose job it is to bring you more of what you project. It's great to have so willing a friend as long as your thoughts are positive and your intentions are set consciously. So often, however, they are neither. Many of our thoughts and intentions reflect deep-seated fears, unhealthy beliefs, and intolerances. For instance, if we fear we're not up to snuff in our job and think, "Good grief, how dense can I be?!" or "I'm never going to be able to learn all this!" sure enough, our brain, mind, and subconscious centers will obligingly provide what we ordered - feelings of inadequacy and stupidity. And, of course, such feelings make it hard for us to concentrate and keep us from learning as quickly and easily as we could if we were free from fear. Or, if we believe we're being treated unfairly, gnaw on feelings of being cheated, and long for revenge, once again the inner sage will obligingly present matching experiences and feelings. It's important to know that your subconscious mind is extremely literal and unable to discern between "true" and "false," "good" and "bad," or "positive" and "negative." What you say, believe, think, fear, and assume, the subconscious will do its darnedest to provide. The wonderful news is that knowing the nature of your inner sage gives you the understanding and ability to use the power of positive to mindfully set life-enhancing intentions that unerringly help you become a magnet for your desired results. Intentions can be both expansive and minute. You can set far-reaching intentions, such as "My intention is to be a mindful woman," or intentions for the moment like, "My intention is to pay absolute attention to my next four breaths." Expansive: My intention is to become more loving. Minute: I choose to respond (or stay silent) lovingly toward _____ right now. Expansive: My intention is to be a healthy weight for my body type. Minute: I am choosing to forgo this piece of candy right now. Intention is an invaluable ally on your journey toward increased mindfulness. One small step that can make a huge difference is to set an intention each morning before you are off and running. I might say, "Today I will be consistently kind." A favorite intention or affirmation if I'm worried about someone I love is "I place ______ in the arms of angels today and know that she or he is loved and protected." Intentions are like personal angels who set our course and light the way to where we want to go and how we want to be in our lives, loves, and attitudes. Of course, because we're human beings, we'll fall short of our intentions time and again. When we do, it's important that we take an accepting, angelic approach and love ourselves back into alignment. Gentle correction is much more effective than criticism and judgment. Contributing editor Melina Papadakis reports on a new book that may cause people to think differently about Alzheimer's. Pamela McDonald, RNFA, FNP, a leading integrated nurse practitioner in San Francisco, is devoted to the prevention of Alzheimer's, Parkinson's, cardiovascular disease and chronic illness. In the 1990s, she began studying the gene that plays a major role in Alzheimer's and heart disease: the Apo E gene, or "Alzheimer's gene." This year, Apo E gene testing has been making the news because many companies have started offering the test, usually priced around $400. This saliva test determines if you carry the Apo E gene variation. Unfortunately, no one is offering a solution to those people disposed to developing the diseases related to the gene. The question is: should you get tested when there is no solution to the problem? McDonald offers a solution to preventing the onset of Alzheimer's, as well as heart disease. She has identified nutrition plans and gene-supportive environments for each variation of the Apo E gene and has seen in her practice how symptoms have been prevented or reduced. For more information, visit www.apoegenediet.com. Do you worry about Alzheimer’s? Has it affected your family in any way? My husband and I have spent the past six months (although it has seemed like 12 years) debating the strengths and weaknesses of Hillary and Barack. As a long-term, bra-burning women’s libber from the ‘70s, I have felt compelled to support Hillary, despite certain questionable decisions she may have made. Never mind – she is a brilliant and capable woman, and nothing could sway me from my belief that this country desperately needs a woman in power. I ordered the Hillary Laughing Pen (www.hillarypen.com) for my husband’s birthday to taunt him with the constant, looming Hillary presence until he relented and put a stop-payment on his donation checks to the Obama campaign. Little did I know that my husband’s cunning and Hillary’s shrill, grating laugh would have me racing to change camps just to get away from the sound of her! The Hillary Laughing Pen plays back a recording of Hillary laughing – no, cackling! – for an interminable amount of time. My husband began sneaking up on me and pushing the play button as I worked and watched TV and slept. The incessant cackling has been too much to take. I have two choices: switch my support to Obama, who has a very pleasant chuckle, or hope her presidency keeps her in a consistently serious mood. Bottled water is out and tap water is in, says the May/June 2008 cover story of E: The Environmental Magazine, now posted at www.emagazine.com. Call it reverse snob-appeal. Just like it has become cool to bring your own cloth bags to the grocery store, the reusable water bottle is the hip new eco-accessory. Bottled water is also contributing to huge amounts of waste and energy consumption. According to the Container Recycling Institute (CRI), it takes 15 million barrels of oil per year to make America’s plastic water bottles. Transporting those bottles by air and truck uses even more fossil fuel. Once people drain the bottles, they rarely recycle them: CRI says eight out of 10 water bottles end up in the landfill. The bottles that end up as litter in streams are washing out to sea, joining a swirl of plastic debris in the center of the Pacific estimated to be twice the size of Texas. It takes 1,000 years for plastic bottles to break down, CRI estimates. Consumers aren't advised to reuse store-bought bottled water, or even plastic bottles made for refilling, due to dangers of leaching chemicals. Research shows that clear bottles made of polycarbonate plastic can leach bisphenol-A (BPA), an endocrine-disrupting chemical. Since BPA has been linked to low sperm counts and an increased risk of breast and prostate cancer, scientists suggest avoiding reusable plastic bottles. The trend away from bottled water may boost sales of home filters. Water-quality experts say most tap water is fine to drink straight from the faucet ­ especially in cities like San Francisco, Seattle, New York City and Denver, where water comes from mountain reservoirs. It makes sense for anyone turning back to tap to become educated about the local public water supply. Since the Environmental Protection Agency requires frequent water quality reports, the data is easy to find. The Environmental Working Group (EWG) makes it easy with its Tap Water Database. You can plug in your zip code and find out whether your local water system is up to par. Visit http://www.ewg.org/tapwater/yourwater/index.php. Do you drink bottled water or tap water? Let your Boomerful friends know where you stand! What is Your Guilty Pleasure, Food- or Drink-Wise? What is your favorite guilty pleasure, food- or drink-wise? Do you like to pig out on bacon sandwiches or something more exotic, like pâté de foie gras? Are you fond of martinis - shaken, not stirred - or would you rather just whip up some Kool-Aid? With summer coming, maybe you are looking forward to cook-outs, ballpark hot dogs, refreshing margaritas, or celebratory cakes (wedding and graduation party cakes will be baked in abundance soon!). 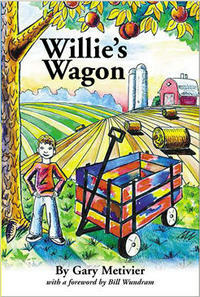 Willie’s Wagon is a perfect story to read to grandkids. It teaches young people about sharing and helping others, and shows the benefits of helping others who are less fortunate. In this colorful children’s book, we meet seven-year-old Willie, a boy who has lost interest in the world around him. To him, everything is “Bor-ring!” Then one day, his family takes him to visit an apple farm, and while playing with a kitten in the barn, he discovers a forgotten children’s wagon which sparks his interest and curiosity. A week or so later, Willie’s class prepares to take a field trip … but Willie is nowhere to be found. But Willie isn’t playing hooky. He has been given permission to prepare a special surprise for a group of less fortunate children. Readers of all ages will find this delightful adventure inspiring and heartwarming. You can find out more about the book at www.willieswagon.com.